I recently picked up the The Family Tree Guide to DNA Testing and Genetic Genealogy by Blaine T. Bettinger. As you can tell from posts on my site, I’ve been working with my DNA for genealogy for a few years now. I took my first genetic genealogy test back in 2006 using National Geographic’s Genographic Project. Since then I’ve also tested at 23andMe and AncestryDNA and have transferred my results to both GedMatch and FamilyTreeDNA. Also at FTDNA, I’ve tested my Y-DNA and mtDNA. If a lot of that sounds like gibberish to you, this book will definitely help. It has a good introduction to DNA and the different DNA tests. Even though I’m fairly well-versed in a lot of the DNA stuff, I still found a lot of helpful information. The book is broken down into three main sections. “Getting Started” is the first section and it goes over the genetic genealogy basics, misconceptions and ethical considerations. It is a good info for anyone getting into genetic genealogy. The second section is “Selecting A Test” which goes over each of the main types of DNA and the tests related to them: Mitochondrial-DNA, Y-DNA, Autosomal-DNA, and X-DNA. 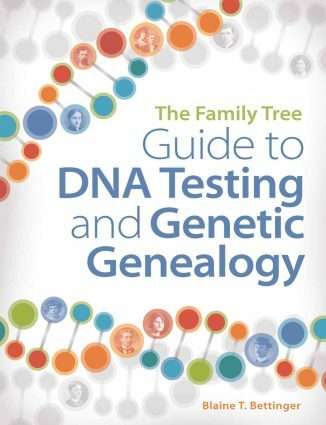 It’s a great read-through, especially if you’re trying to figure out a specific genealogical mystery in your tree since it will help you decide which test is best for solving it. The third section is “Analyzing and Applying Test Results” which gets into more advanced tools for analyzing your DNA. This includes an overview of the most popular third-party tools, like GedMatch, and things like the often-marketed Ethnicity Estimates. This section also delves into using DNA testing for adoptees, which isn’t something I’m personally familiar with, but I imagine is a very powerful tool. I personally like having all of the information in one place rather that bookmarking multiple websites and random notes. If I’m looking for where my X-Chromosome may come from in my ancestry, I can just pull up the X-DNA chart. How is a third-cousin twice-removed related to me? I can check the handy reference chart. The author, Blaine T. Bettinger, has long been known as one of the best genetic genealogy resources in the community. His blog, The Genetic Genealogist, has always been one that I read often. He’s very knowledgeable in the subject and his writing is very easy to follow. I was able to get through the book in only a few days and it still sits actively on my desk as a constant reference. I’d recommend it to everyone involved in DNA testing, from those new to DNA testing to those who have tested but want to learn more.